Original Oil for sale on canvas 30" x 20" plus frame £1,295 please 'phone to view. 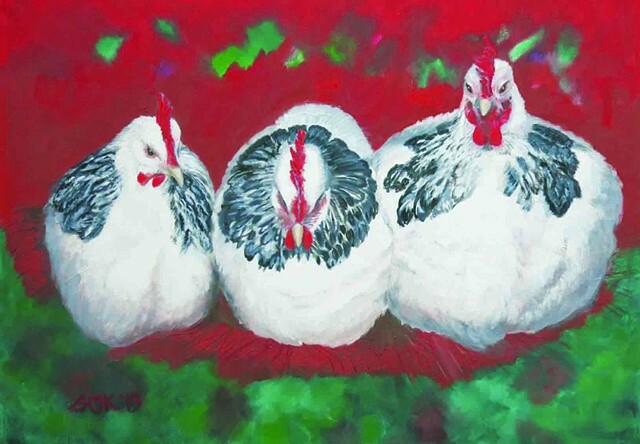 These are my three hens, Cherry, Berry and Merry. Cherry is the fat one on the right, she lays the least eggs, Berry is in the middle and a good 'little doer' and Merry, the smallest is on the left and is the best layer of them all. Here they are roosting just before falling asleep snuggled up for warmth and in their pecking order.